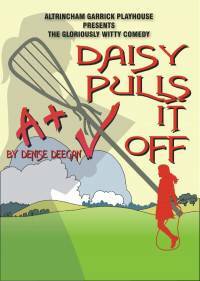 DAISY PULLS IT OFF engagingly captures the uncomplicated innocence of Angela Brazil’s schoolgirl novels. It is about the attempts of superachiever Daisy Meredith to submerge her poor elementary school background and find acceptance in the snobby confines of Grangewood School for Young Ladies. Our plucky heroine undergoes a number of tribulations (including possible expulsion) before, by being honourable and straight in all things, all comes right in the end with Daisy saving the lives of sneaky Monica and toady Sybil – her arch enemies – discovering the treasure of Grangewood, scoring the winning goal at hockey and finding her long-lost father!